As the highway soars above the embankment at Seongsan, we decided to transform the drab approach to the existing tunnel into a little pocket park. The new brick pathway leads to the tunnel entrance. 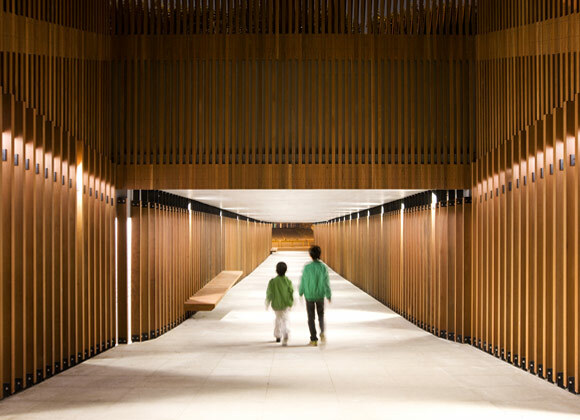 Both the entrances and the interior are clad in timber slats, which playfully wrap around the retaining walls and concrete structure. Generous timber benches flank the interior and the entrance areas. Through the use of simple and durable materials combined with the dramatic effect of the indirect lighting on the timber slats, we aimed to created a monument to the park at an instantly recognizable and human scale. At Banpo, the undulating brick walls of the tunnel open onto a wide and dramatically lit staircase and ramped access route. White concrete, warm yellow bricks and a softer than usual lighting emphasise the texture of the materials used. Aluminium panels on the ceiling reflect light throughout the tunnel and the brick framed entrance facing the river offers generous seating. At Poongnap, the tunnel is bisected by an existing lightwell. By adding and combining bright concrete with warm, yellow bricks and an adjustment of the lighting, we emphasised the dramatic play of light during the day. At night, an alternative move of light and shadow unfolds through the direct and indirect lighting. 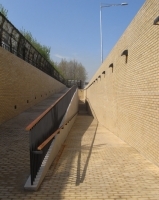 At the entrance, the brick walls fold horizontally to form a bench offering cyclists a resting place in the shade of the embankment.